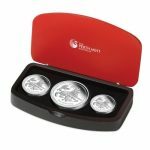 Contains 1 oz of .999 Fine Proof Silver. 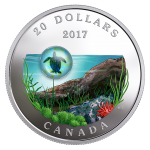 Coin comes in a plastic flip and is likely to have spotting and/or abrasions. 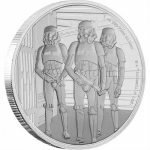 Sovereign coin backed by the Mexican government. 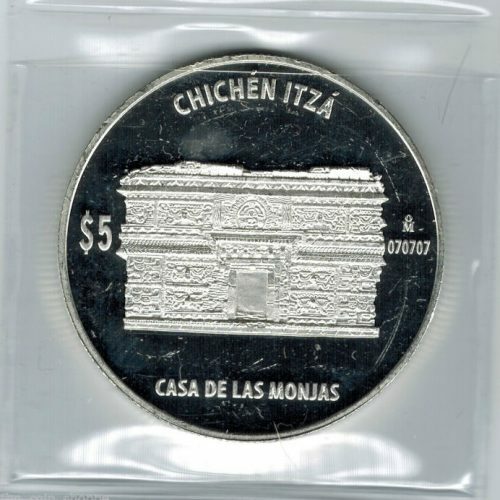 This series of five silver coins broadens and continues the dissemination of the Mayan civilization’s cultural wealth, in particular its architecture, which has been declared World Cultural Heritage by UNESCO, while in 2007, the site of “Chichén Itzá” was declared one of the Seven Wonders of the World, raising the interest of coin collectors and the public in general in them. 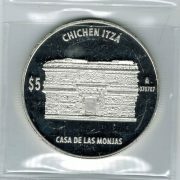 Chichén Itzá was declared one of the Seven Wonders of the World on July 7th, 2007 in Lisbon, Portugal, which is why the number 070707 is written on the back of the coins, just below the Casa de la Moneda mint. 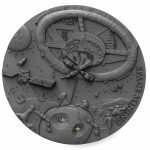 In the upper field in a semi-circle the name “CHICHÉN ITZÁ”, in the center is a building located in the ruins of Chichen Itza. The structure was named “Casa de las Monjas” by the Spanish who were reminded of convent buildings back home. 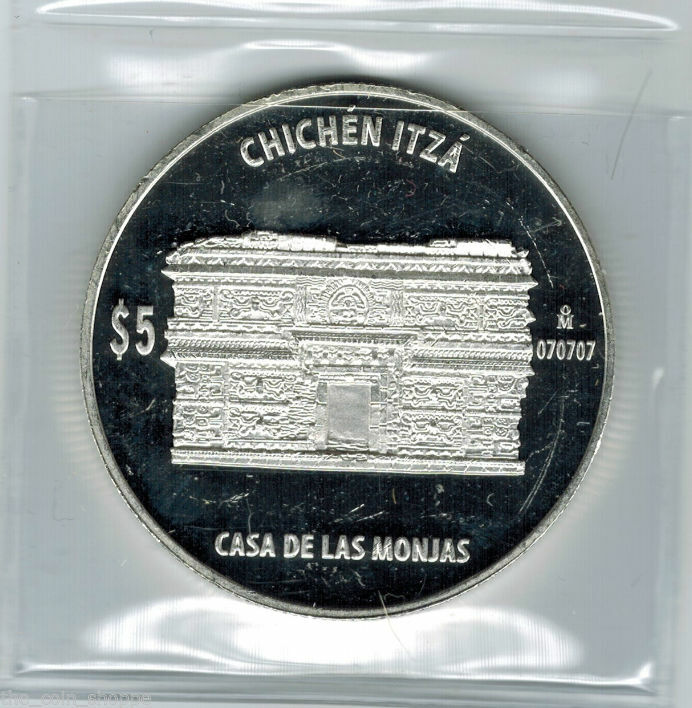 In the left-hand field the “$” sign followed by the number “5”; in the right-hand field the mark of the Mexican Mint, la Casa de la Moneda, and below it the number “070707”. The obverse side of these coins bears the National Emblem in sculptural relief surrounded by the words “UNITED MEXICAN STATES” in a semi-circle above it. 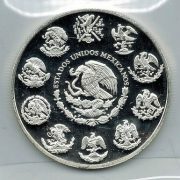 Surrounding it, and following the contour of the border, the different emblems used throughout Mexico’s history are reproduced as well as the eagle, which is placed in the middle of the first page of the Mendoza Codex.